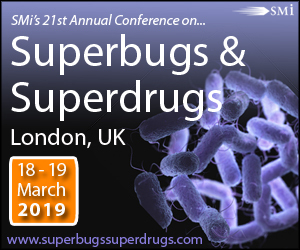 Registration is now officially open for SMi’s Superbugs & Superdrugs Conference, returning for its 21st year to London, UK on the 18th and 19th March 2019. LONDON, ENGLAND, UNITED KINGDOM, November 1, 2018 /EINPresswire.com/ -- As the global threat of antimicrobial resistance continues to grow, the advances of modern medicine are at risk of being lost. Failure to act quickly means the spread of antibiotic-resistant bacteria could lead to increased mortality from normally minor injuries and benign infections. The brochure is now available to download on the website, with the full program of presentations and the official speaker line-up. Keep up to date with the latest conference news and learn more about the event at http://www.superbugssuperdrugs.com/einpr. Book your place before 30th November to save £400.